It's the last Wednesday of the month which means it is time once again to link up with Mel, Shay, and Sheaffer for What's up Wednesday! 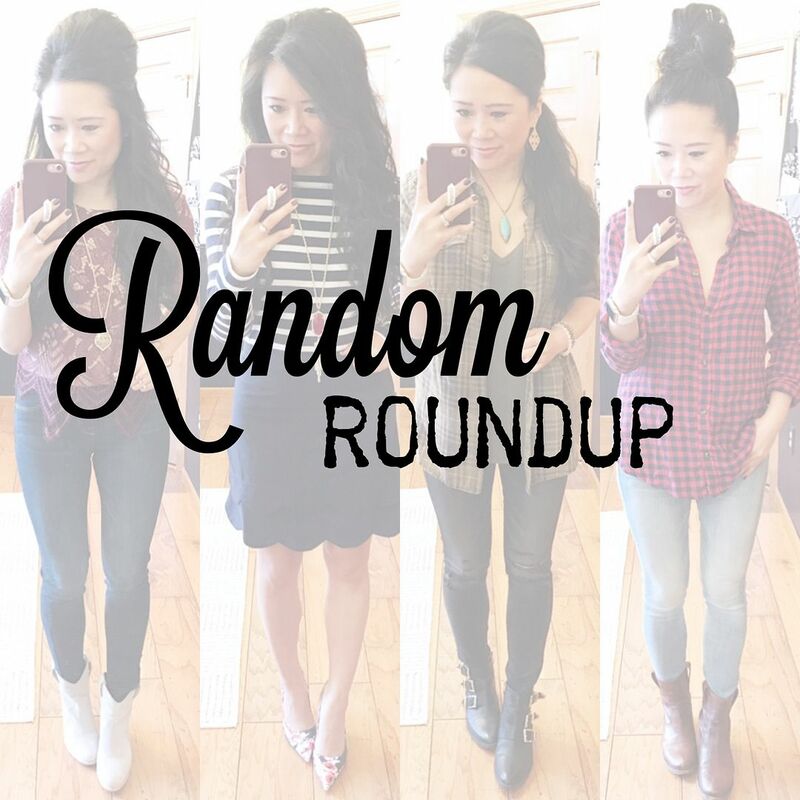 Since I skipped my Random Roundup post last week, I thought I would go ahead and share this with you today vs. on Friday and mix in my life randoms with my outfit randoms. March has been a helluva month, so let's get started! 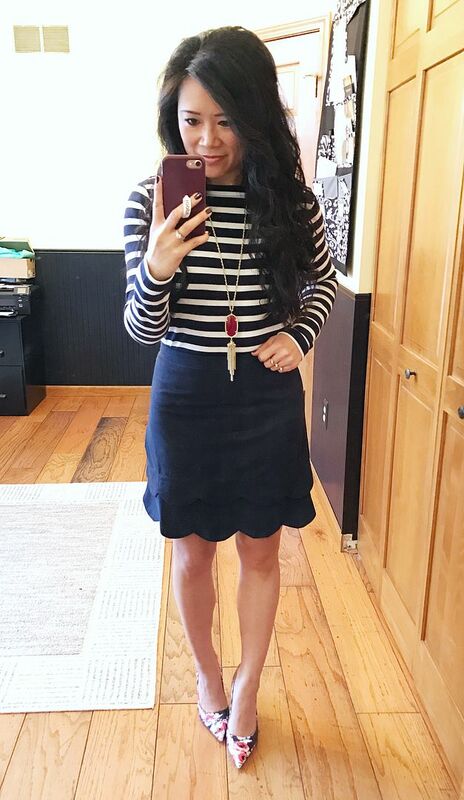 Top: Gap (option) | Necklace: Kendra Scott "Rayne" (similar) | Skirt: Paperdolls Boutique (option) | Heels: Kate Spade "Licorice"
The last couple of months, I was talking about our much anticipated work convention in Nashville. Well, it has now come and gone and I think I'm going through major withdrawals! It was so so so much work plus more work on top of that, but it was all so very worth it, as I expected, and I kinda wish we could do it all over again. If you missed it, you can catch all the details about what we did in this post here as well as a huge mix and match packing post here. Just trying to catch up on life really, and get back into the normal swing of things. The husband has been pretty busy with work travel, which ends up throwing a wrench into my normal routine as well. This weekend, we finally didn't have any plans, so it was good to just go with the flow. We ended up going to the movies even! We saw Beauty and the Beast. I swear, everyone I knew saw this movie last weekend with their kids, and I only heard good things about it, which is why I wanted to go. I loved it. And of course I cried because I cry with basically any movie and the husband gives me the "you're pathetic" look every time as if he should be surprised by now when something pulls on my heart strings! Ha! Well, we cleared out one of the corners of the basement in preparation for my new Pilates reformer! 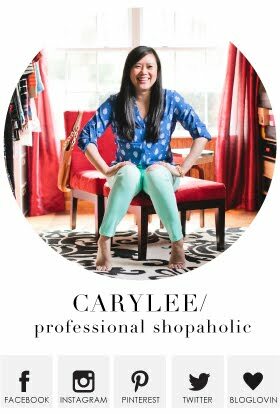 I also want to buy some big full length mirrors for one side of the room (super helpful to watch yourself work out in the mirror) and then white curtains for the back wall of the room. Eeeeek! They are making it for me as we speak and it's set to ship on March 28th! They said to allow 5-7 days for shipping, so hopefully by the first week of April, I will be all set up! I CANNOT WAIT! If you missed my Pilates update this month, you can catch yourself up in this post here! BASEBALL!!!!! The home opener is on Sunday and guess who has tickets?! This gal! We split season tickets with 3 other people, which gives us about 20 home games to attend. It's pretty seldom that we end up with tickets for the home opener, so I'm extra pumped to go to my first game! Plus!!!!! We are playing the Cubs, which is always a fun time, but on top of that, my favorite ex-Cardinal who was a Padre last year is now a CUB! So that means I get to watch him play for the home opener, and actually a lot more throughout the season. We play the Cubs a ton, so yay for that! And yes, I'm getting grief from Cardinals fans because I can't promise I'm not going to cheer for him. So. 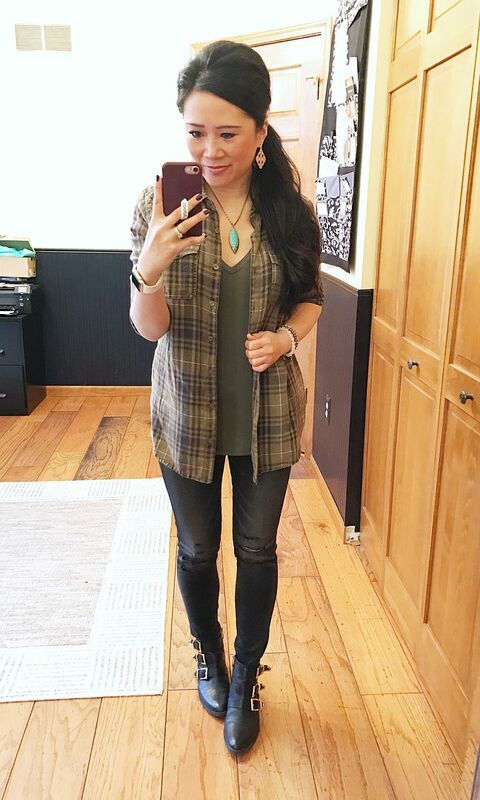 Flannel: BP | Necklace: Kendra Scott "Milla" | Top: Express London tee (option) | Bottoms: American Eagle (limited sizes) | Booties: Vince Camuto "Tipper"
I can't seem to get Ed Sheeren's "Shape of You" song out of my head lately! I wake up singing it in my head every morning, it's quite bizarre! Needless to say, it's currently my favorite song on the radio at the moment. And whoa - I just read this article here about how Ed Sheeren admitted that TLC's "No Scrubs" inspired his song. Mind. Blown. Flannel: American Eagle | Bottoms: American Eagle | Booties: Frye "Anna shortie"
These are actual outfits I wore last week, so they aren't super outdated by any means. As you can see, it is still very much NOT spring here yet. We will get "a" random day when it hits 80-degrees, but by the next morning, we're back to 50's as the high. It's a bit frustrating in terms of outfits because I hate to retire ALL of my winter clothes when I know I'm still going to need them. Someone made a comment about how this winter really hasn't been harsh at all so they can't understand why everyone is wishing for spring. While I agree with that (we didn't get ANY amount of snow this year other than dusting, which is so sad), I think the wishy-washy weather is what bothers me most! I wish it would EITHER be cold OR be hot, but this switch every couple of days is so schizophrenic. The flowers outside don't know whether to bloom or stay dormant. Everyone is just confused! So yeah. That's my beef. Get your sh*t together, Mother Nature! Not much else new to report. Last month I mentioned that we got an adjustable bed, and I have absolutely been loving it!!! It's a Broyhill, and although we price-compared some others online, it really was the first and only one we actually tried out in the store. But so far, it's been amazing. I am constantly using the remote to lower and raise myself throughout the night. Basically, I only have it completely flat when I'm sleeping on my side. Otherwise, my feet and head are always elevated and I seem to be falling asleep and staying asleep so much better now. The one thing I struggled with was always losing my remote! It's cordless, and the husband and I each have our own. But, I've learned to just stick it under the same side of my pillow so it stays put and I always know where it is, even when I'm half awake in the middle of the night. Seriously, it's a game changer and I wish we got an adjustable bed sooner! That basically sums up my March for you! On to April!!! Have a great rest of your week! March was a crazy month for all of us, so excited for your reformer and so jealous of your new bed. Oh man, your in-house pilates studio is going to be amazing with mirrors and everything! That's so exciting!! I'm glad you liked Beauty & the Beast too! When I was walking into the theater the man said, "Have your tissues ready." So obviously you are not the only one who found it emotional. :) And I am loving all of your weather-whiplash outfits! 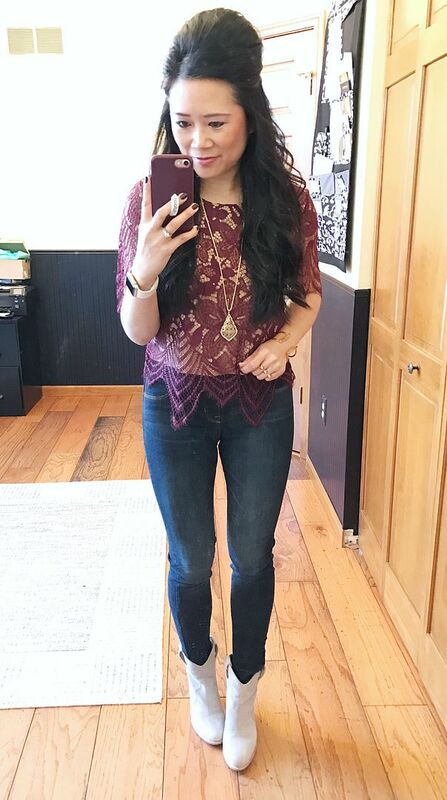 Great inspo for combining various tops and jeans (or a skirt in one case!) 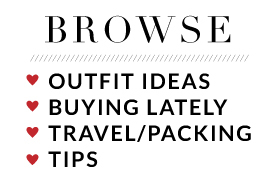 and shoes. You make it look easy. It's been pretty cold here too so I can't retire my layers yet. I wish we would even get a one day break with a higher temp! I'm envious that you can wear skirts without tights even sometimes! Love those floral heels too!